Yesterday I went to Wal-Mart with the intention of picking up a box of washing soda to make some detergent. I went to my usual spot and mindlessly grabbed this box. OOPS….. When I got home I realized I had grabbed the wrong box. 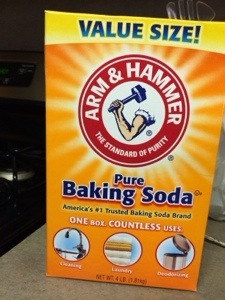 I ended up with a massive box of good old baking soda. Seriously? I was determined not to be discouraged. I remembered reading a post a while back about how you can cook baking soda to make washing soda. So that’s what I did. It was awesome!! 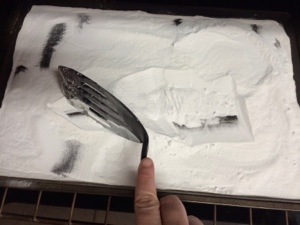 I measured 2 cups of baking soda and spread it thin over a baking sheet. You don’t want to pile it on, keep it as a thin layer. 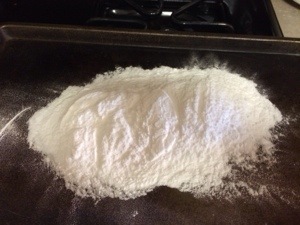 The key to converting the baking soda is to evaporate the water. There is a lot of chemistry involved but that is the bottom line! The thicker you pile on your soda, the longer it will have to cook to get rid of the water. Set your oven to 450 degrees. Cook the soda for about an hour, turning with a spatula every 10 minutes.